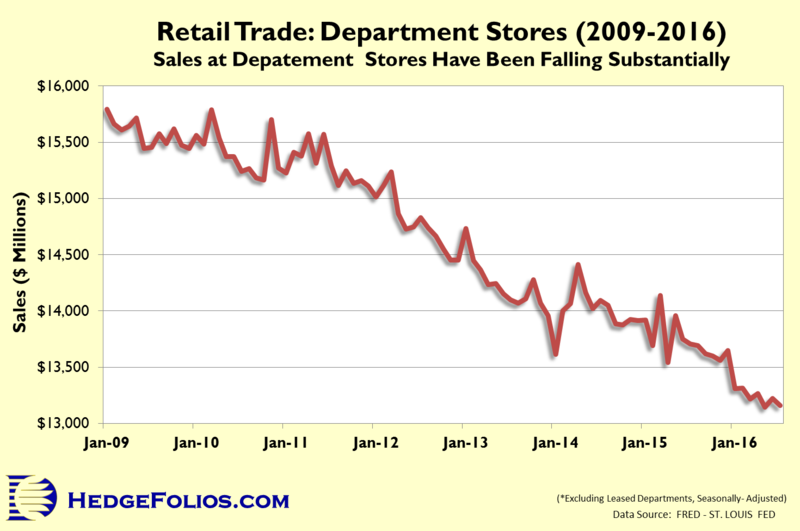 Retailers’ Stocks Spike While Retail Sales are Collapsing! 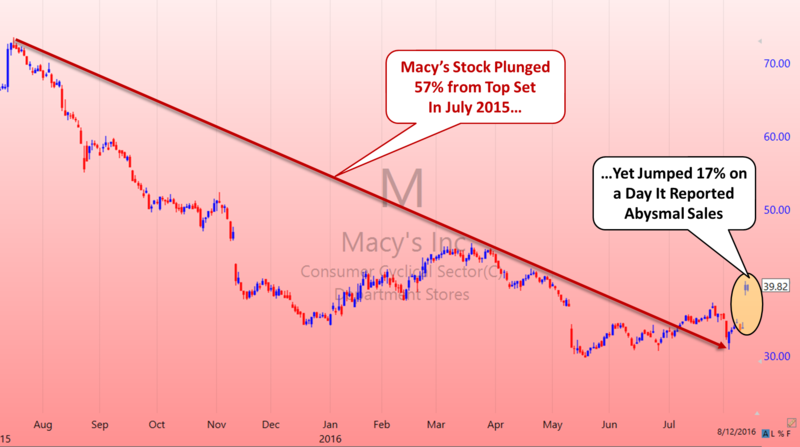 Over the past two trading days the stocks of some of the biggest retailer’s, such as Macy’s, sky-rocketed ahead of the official July 2016 retail sales data. That was strange as Macy’s reported it would close 100 stores. Well, you don’t close stores because business is so good. Furthermore, Macy’s reported that net income plummeted 95% in 2Q, year-over-year. The first quarter, on a year-over-year basis, sales dropped 5.7%, and net income dropped 82%. But the stock soared 17%. So why did the stock rally? Yesterday’s U.S. retail sales number was a big disappointment for the bulls. 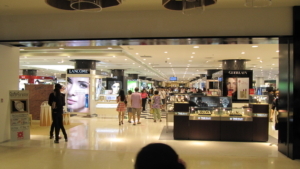 Analysts were expecting as much as a +0.7% retail sales growth rate for the month. However, July retail sales, excluding autos, came in negative at -0.3% growth. That means recession! Retailers’ revenues have been in a big downtrend for several years. Consumers have record low levels of savings and their credit cards are maxed out. So far in 2016, analysts in the media are telling investors to simply shrug-off the awful retail sales numbers that we have seen all year long. This year, Macy's, one of America’s largest retailers, reported its steepest quarterly same-store sales decline since the 2009 recession. On Thursday, August 11th, the firm reported it would be closing 100 stores in 2017 and that sales dropped 4% in the second quarter of 2016. However, look at the big up-gap on the stock chart after the bad news was announced. Obviously, the “algo-trading” operations found it profitable to squeeze the shorts to the wall. That’s how today’s markets work. Nothing is real any more. When fundamentals deteriorate for years, but the stocks have a good rally, there is something wrong. In the end, reality always returns. We predicted last year that the big retailers would all be big losers and that shopping centers would experience significant shrinkage. Why is this so important? Because Retail is a sector that illustrates when large macro trends are changing. When a consumer can no longer afford to spend like they used to, it means that the economy has plateaued and more problems are sure to follow. This just reaffirms what we have been telling our readers for months and helps us position our HedgeFolios members, so they can be prepared BEFORE market sentiment changes and can even profit when the markets decline. Wall Street analysts and money managers have conflicts of interest and are prevented from giving honest advice, as they can’t tell their clients to sell. Their business model is based on collecting enormous fees and commissions while keeping their clients invested during good times and bad. Our business model at Dohmen Strategies is based on the success of our members. As they perform well in bull and bear markets, we earn their continued business. With HedgeFolios, everyone pays the same membership fee, no matter how big your portfolio is. We don’t even ask. And you can replicate one or all five of our portfolios for the same fee. It’s that easy. With our revolutionary HedgeFolios program, all you do is line up your portfolio with our models with just a click of the mouse. It’s that simple. It’s not too late to join. Don’t make the mistake of sitting on current losses until they turn to giant losses. That’s what too many investors do, and it can be devastating to your portfolio. P.S. Right now, we have a “LIMITED TIME OFFER” for all new members with our two plans, the Platinum Annual Membership (a 25% savings) and the brand new Gold Quarterly Membership (a 15% savings).